It is no secret that I love most all foods — the majority of my posts are about growing food or cooking food. 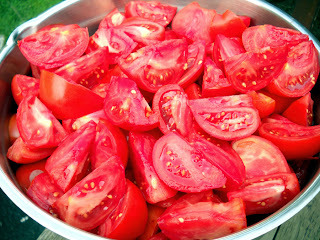 But to me nothing in the world tastes better than true garden tomatoes (grown outdoors under the summer sun), fresh basil, and pungent garlic. Those flavors make me swoon. Unfortunately for me and all other Northeasterners, our growing season is short, and you must savor these flavors while you can — or can them! that I prepared for my tomato, basil, garlic sauce. I will not lie to you: it takes a long time to make and preserve a homemade tomato sauce; it took me over 6 hours this past Sunday. But in December, when you sit down to a steaming Italian dish made with your summer loves, it is all worthwhile. This year I did not grow enough tomatoes to make a batch of sauce, so I resorted (but not a bad resort) to buying a 20-pound utility box of tomatoes at the farmers’ market. The other ingredients were my own, homegrown: shallots, garlic, and basil. That is all there is to the recipe, no cornstarch, no preservatives, no salt — all pure, natural, healthy, delicious, locally grown produce. my grandmother. The rest my husband and I will have for dinner tonight. 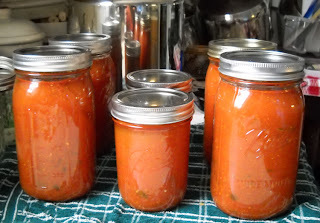 The recipe I used for my sauce was from the cookbook that came with the Ball canning kit — this recipe worked for me because it called for 20 pounds of tomatoes, and that’s exactly what I had. However, there are many recipes that will not take as much time because they call for lesser amounts of produce to be reduced down. 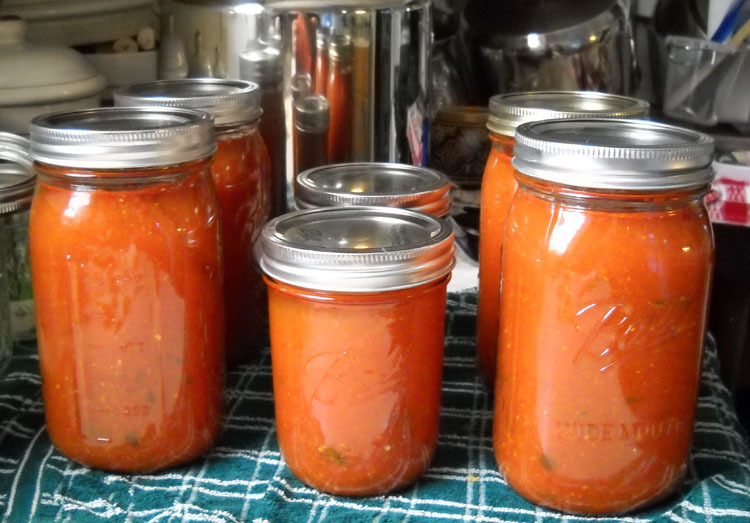 Additionally, if you don’t have canning equipment, freezing is a great alternative. Frozen tomato sauce lasts for months, so get to it! Storey's Put ’em Up!, The Beginner's Guide to Preserving Food at Home, Tomato: A Fresh-from-the-Vine Cookbook, and The Big Book of Preserving the Harvest are just a few cookbooks with tomato sauce and tomato canning recipes. In my opinion, it doesn't matter what recipe you use; just don't let those summer flavors pass by as quickly as the warm weather!